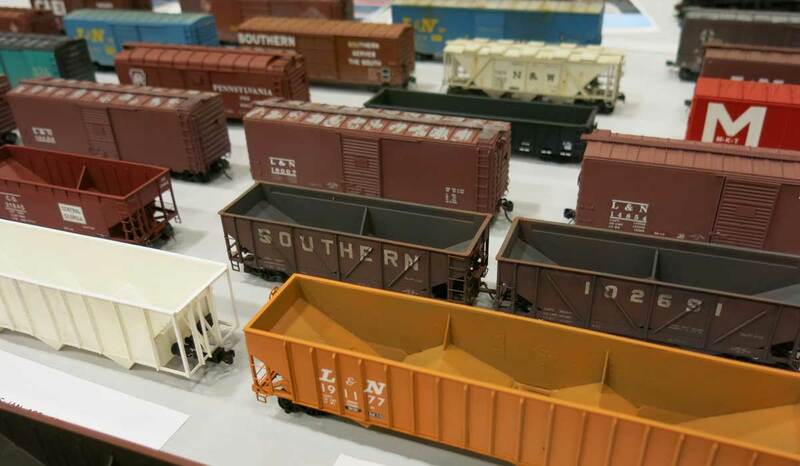 Here are just a few of the hundreds of models that were on display at the 2015 St. Louis RPM meet. A couple of Railroad Prototype Modeler (RPM) events are on the calendar soon. First up is the St. Louis RPM in Collinsville, IL, August 12 & 13. We had a great time at the 2015 event. Getting there from the airport was easy, with very little traffic to negotiate once you are at the convention center. Unfortunately, Resin Car Works is unable to attend the St. Louis meet as there’s just too much to do. There are details for new kits to wrap up, RPM Chicagoland commitments to fulfill, and there are several honey-do projects at the house. Here’s a quick look at the RPM events ahead on the calendar. The Mid-Atlantic RPM meet is set for late September in Fredericksburg, VA. Organizer Norman Wolf has put together another solid event. Make plans to attend this event on September 30 and October 1. The RPM Chicagoland event is taking shape for the October 20-22 weekend in Lisle, IL. This will be the 23rd annual RPM conference for the region. Resin Car Works is assisting with the mini-kit for early registrants and we are planning to attend and sell some kits! Lastly, the Mid-Eastern Region of the NMRA is holding a convention in Durham, NC, on the October 20th weekend. An RPM component is included with several strong presentations and a model display room. Check out their Tracks to the Triangle website for additional details. We encourage you to attend one or more of these fine events. Take along a few models to display at the event. Finished models are always welcome but your in-process work generates lots of conversations. Don’t miss an upcoming RPM event! Check the links above for presentation schedules, hotels, and other details. do you do n scale ever? Does anyone know if there will be a day of free browsing among the sales tables for those not attending the conference itself? Thanks for your response. I’m referring to RPM Chicagoland, in October. Thanks for the advertising, Eric. We will be huge this year–about 24,000 sq. ft. with five scale operating layouts on site, home layout tours, clinics, hands-on demos, 110 tables of hand-picked vendors (no swap meet stuff!) and 19 historical societies, and much more. And of course the models! I literally stopped counting at 2,300 models brought by attendees last year–I ran out of fingers and toes. 54 tables jam-packed with your models. Despite all the extras, we still concentrate on your models–that’s what we’re all about. RCW can’t attend but we will have Speedwitch, SC&F, Yarmouth and F&C on site. I hope you guys can make it. It’s going to be a whopper. And bring your models! Will Frank be at the St Louis RPM selling the SOO Line box car kits ?